The Ficus retusa, also known as Ficus microcarpa nitida and Taiwan Ficus, is among the most tolerant, versatile and trouble-free bonsai trees for indoor use. It is a native of Malaysia and other Southeast Asian countries. 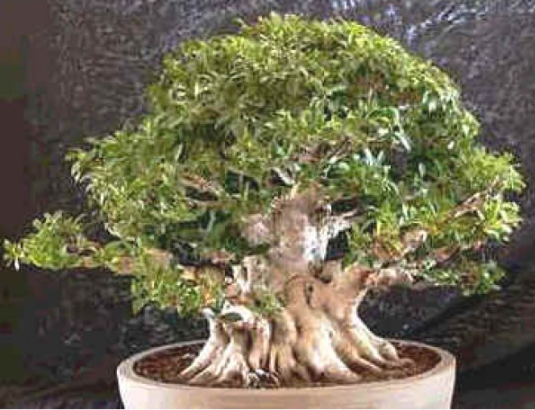 Ficus retusa grows to about 30-60 feet in the wild, but it is easily trained as a bonsai. It is an ideal tree to use for beginners. 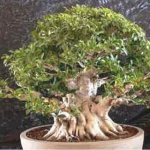 The Ficus retusa, also known as Ficus microcarpa nitida and Taiwan Ficus, is among the most tolerant, versatile and trouble-free bonsai trees for indoor use. It is a native of Malaysia and other Southeast Asian countries. Ficus retusa grows to about 30-60 feet in the wild, but it is easily trained as a bonsai. It is an ideal tree to use for beginners. This small tree has smooth reddish bark dotted with small horizontal flecks, similar to tiger-like markings. It developes aerial roots, upright growing branches, and a very dense foliage. Banyan produces aerial roots that hang down from horizontal branches and take root where they touch the ground. Ficus retusa has small dark green leaves which alternate up the stem and which are more oval than the benjamina. The foliage grows upright. This tree has leaves in all seasons. Flowers from February to April. It bears fruits, yellowish when ripe, in pairs and crowded at the ends of tender branches.To prevent die back, prune only when the tree is actively growing. Hardiness zones 9-11, (5ºC/40ºF, -5ºC/25ºF) in Winter. It is a tropical and must be kept inside when the temperature gets below 40ºC. Ficus retusa grow best in full sun with plenty of water. The tree is not particular in what type of soil it is potted as long as it is a well draining mix. Fertilize with an organic or all purpose fertilizer every week.